April 1946. W. C. T. U. TO MEET TUESDAY The W. C. T. U. will meet on Tuesday at 2:30 at the home of Rev. and Mrs. D. E. Skiles at 633 Main street. Apr. 18 1946 W. C. T. U. HAS INTERESTING PROGRAM The Woman's Christian Temperance Union met Tuesday with Miss Ada Park, who also presented the program on the assigned topic "Let Youth Know." Mrs. Ralph Allen spoke on the Youth For Christ meeting which her son, who is in the navy, attended in Boston. This movement, Youth For Christ, is founded on the principle that when the gospel of the Lord Jesus Christ lays hold on any life--be it young or old--a basic transformation takes place within the individual. Youth For Christ rallies in many cities are being very helpful. The recitation of a poem by a grade school pupil Beverly Lunn was a pleasing part of the program. Apr. 1946 The April meeting which was to have been held at the Skiles home with Mrs. Skiles in charge of the program, and Mr. Skiles as devotional leader, had to be held elsewhere, as Mrs. Skiles had had a nervous collapse. 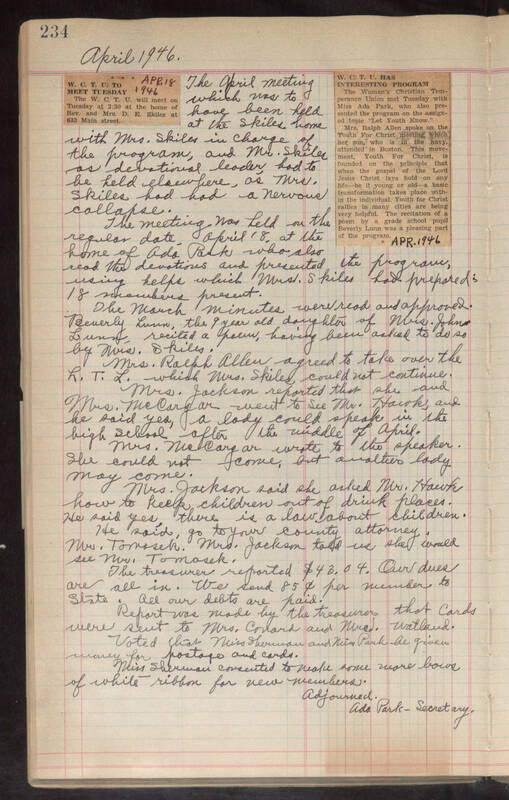 The meeting was held on the regular date, April 18, at the home of Ada Park who also read the devotions and presented the program, using helps which Mrs. Skiles had prepared. 18 members present. The March minutes were read and approved. Beverly Lunn, the 9 year old daughter of Mrs. John Lunn, recited a poem, having been asked to do so by Mrs. Skiles. Mrs. Ralph Allen agreed to take over the L. T. L. which Mrs. Skiles could not continue. Mrs. Jackson reported that she and Mrs. McCargar went to see Mr. Hawk, and he said yes, a lady could speak in the high school after the middle of April. Mrs. McCargar wrote to the speaker. She could not come, but another lady may come. Mrs. Jackson said she asked Mr. Hawk how to keep children out of drink places. He said yes, there is a law about children. He said go to your county attorney, Mr. Tomasek. Mrs. Jackson told us she would see Mr. Tomasek. The treasurer reported $43.04. Our dues are all in. We send 85₵ per member to state. All our debts are paid. Report was made by the treasurer that cards were sent to Mrs. Covard and Mrs. Watland. Voted that Miss Sherman and Miss Park be given money for postage and cards. Miss Sherman consented to make some more bows of white ribbon for new members. Adjourned. Ada Park - Secretary.